Those 14 words ARE powerful. I am writing them down now and I am going to remember them. Thank you for this! Hello Positively present :) Hope your having a fabulous week! 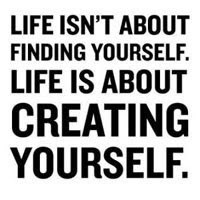 "Life isn't about finding yourself...Life is about CREATING yourself" - That is Brilliant!! It' exciting to know not only that you can do anything you put your mind to but also that you can be any kind of person you want to be. You gleem with positivity. I love the encouraging quotes you find. Peace. Pretty POWERFUL stuff my friend! Butternut Squash, you bring me unexpected moments of Happiness. Gratitude preserves old friendships, and procures new. I LOVE it. I am writing those words down and keeping them on my mirror! Thank you! "Many members of the Fortune 500 Club could easily earn membership in the Misfortune 500 Club." Agree. People can be stressed to a higher level and forced to win. Adversity is the best lesson.